Recipe of the Day: It's Pumpkin Pie Day! It's National Pumpkin Pie Day. Really, we didn't just make that up! While we don't need a special day to celebrate pumpkin-based confections (isn't that what Thanksgiving is for? ), we decided to honor the day with one of our favorite and slightly decadent pumpkin pie recipes: Pumpkin and Caramelized-Pecan Pie. It's National Pumpkin Pie Day. Really, we didn't just make that up! While we don't need a special day to celebrate pumpkin-based confections (isn't that what Thanksgiving is for? 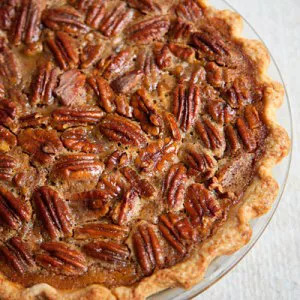 ), we decided to honor the day with one of our favorite and slightly decadent pumpkin pie recipes: Pumpkin and Caramelized-Pecan Pie. What could be better than combining two fabulous pies into one? We can't think of a thing. And although this is a sweet treat, it has a healthy side too. A slice of this pie delivers more than a day’s worth of vitamin A. Plus, it has a whole-wheat crust and contains 3 grams of fiber. Recipe of the Day: It&#039;s Pumpkin Pie Day!